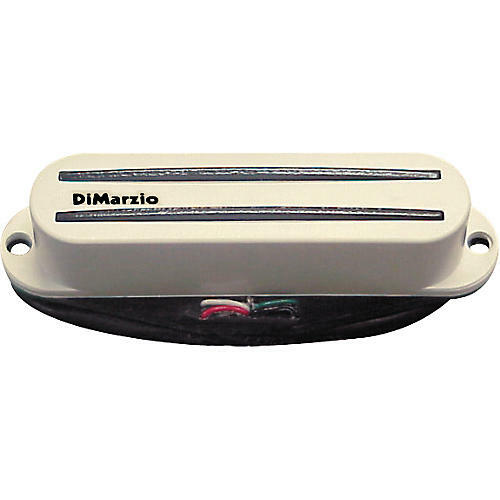 The DiMarzio DP189 Tone Zone S Strat Humbucker Pickup brings the famous performance of The Tone Zone to a humbucking Strat replacement pickup. Built-in is the tremendous mid-range and bass response of the original Tone Zone, and the same patented dual-resonance design produces great harmonics. DiMarzio also took into account the likelihood of installing The Tone Zone S in the classic slanted Strat bridge position, warming up the higher frequencies and brightening the low notes a little. It has 4-conductor wiring for parallel humbucking and split-coil modes, and makes a great bridge position combination with the Pro Track (our sku# 302326), The Chopper (our sku# 302460), and Fast Track 1 (our sku# 302441). Recommended For: Bridge position, solid body guitars. Neck position when a very warm jazz guitar sound is required. Tech Talk: If you compare the specs of the full-size Tone Zone with those of the Tone Zone S, you will notice they don't match. That's because the trick in building a single-coil size pickup to sound like its big brother is to go for the sound rather than the numbers. DiMarzio also took into account the likelihood that the Tone Zone S will be installed in the classic slanted Strat bridge position, so they warmed up the higher frequencies and brightened the low notes a little to compensate.